Wish all my friends, my readers a very happy Vinayagar Chathurthi..May the God bless everyone on this auspicious day. Take the wheat flour, all purpose flour, semolina, salt , ghee in a bowl and mix everything together. Now add water little by little and form a slightly stiff dough like the poori dough. Close the bowl and set aside for 15 minutes. Now for the filling, Dry roast the poppy seeds for a minute ot two and set aside in abowl. Heat the ghee next, add the 1 cup of shredded coconut and mix well with the ghee. Now add 1/2 cup of jaggery to it , mix well with the coconut until the jaggery melts and combines well. Add the roasted poppy seeds, salt to the jaggery coconut mixture and combine well. Let it cook for a minute or two and switch off. Add the cardamom powder once the filling is cooled.Mix well. Now divide the filling into small balls and set aside. 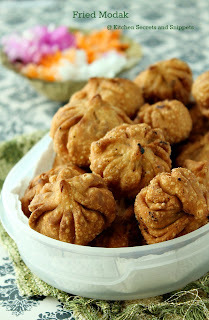 Pinch out a small piece of the dough and roll into a thin circle, just u roll for making poori, just make sure u roll it very thin to ensure the cover turns crispy when fried. 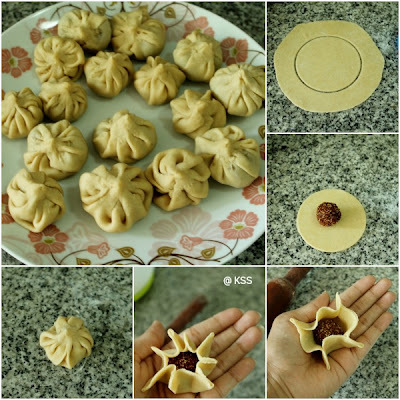 Place the filling the middle and pinch the edges all over. Now bring the edges together snd seal it thoroughly. Place in a separate sheet and cover it. Do the same for the remaining dough. Heat the oil over medium heat until the oil becomes hot but not smoking hot, it just needs to be medium hot. Slowly drop the prepared modak one by one and fry until it turns golden brown Flip them and cook as well.Drain and place them on a paper towel. Let them cool down to room temperature and serve. 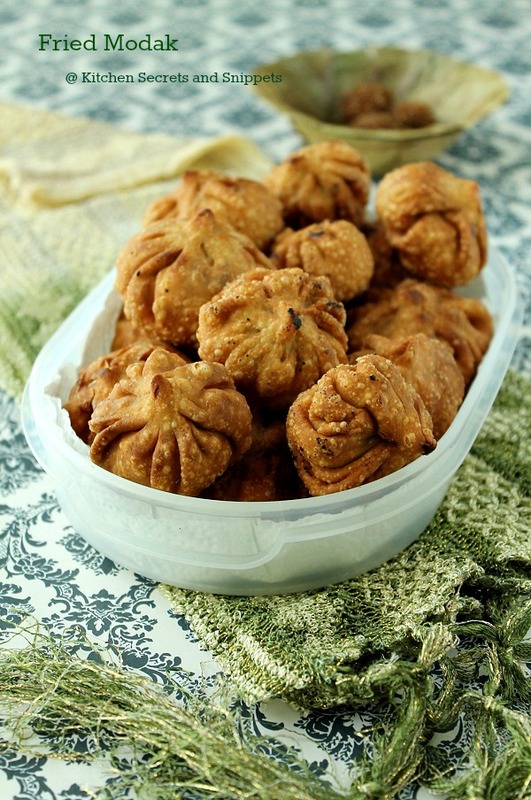 Modak looks too good.pictures too. gorgeous snaps ! love those modaks ! 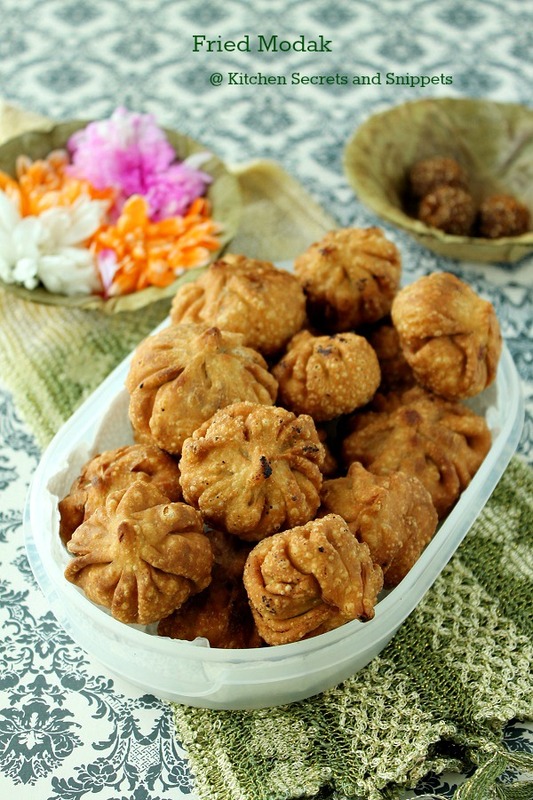 Omg, those fried modaks are just torturing me, love to munch some.